GALION — There was a sense of familiarity Monday evening as Galion City Council met for the second time in June. For the first time in two months, Mayor Tom O’Leary was back in his seat, to the right of City Council President Carl Watt, who also was back in his seat. The musical chairs came about in early May after O’Leary’s surgery to repair an abdominal aortic aneurysm. Watt had served the past two months in O’Leary’s absence, which meant Gail Baldinger had been serving as city council president. With 14 items on the agenda, Monday’s meeting was longer that most in recent months, but everything went on without a hitch. The first three items on the agenda involved the police department. Chief Brian Saterfield was given an OK to apply for a COPS (Community Oriented Policing Service) grant that, if received, will pay 75 percent of the wages and benefits of a full-time police officer for three years. That officer would serve as the School Resource Officers for the local school district. 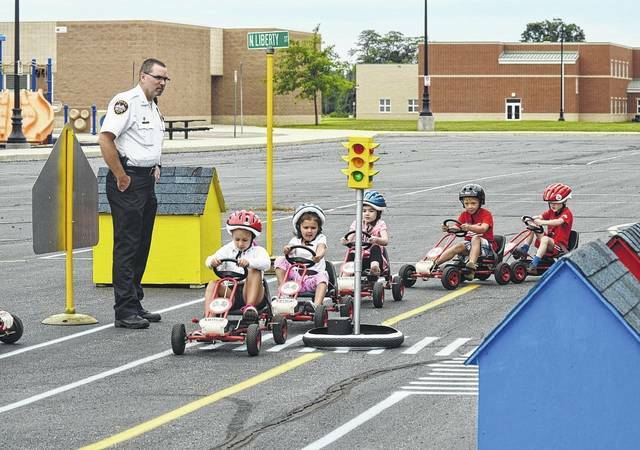 Also approved was a $2,500 donation to the police department to help fund the department’s Cops for Kids program, an effort to get Galion police and children in the community to better know one another. Officers will be handing out free popsicles to kids this summer in the community. City council also approved the hiring of a part-time property/evidence room custodian to help organize the department’s evidence room. No extra funding is needed to fund the position. The wording of a purchase agreement was approved in which the city will buy 22 acres of land, valued at $181,608, adjacent to the airport. The plan is to use an FAA (Federal Aviation Administration) grant to pay for 90 percent the project. The city has to have the purchase agreement in hand, and signed by the seller, before it can apply for the grant. The land is to be used for “future expansion” of the airport that could include more hangers, a taxiway, a runway extension or something else. Until that expansion takes place, the agreement gives the seller of the property permission to lease the land — at market price — from the city to farm it. On the subject of a traffic light being installed at the intersection of Brandt Road and Ohio 598, he explained that a traffic study already has taken place, and because the property on all four sides of the intersection is not fully owned by Galion, the traffic volumn at this time is not enough to warrant a traffic light. Councilwoman Shirley Clark said the new restroom facility at South Park has been completed and Service-Safety Director Nikki Ward added that as soon as it passes its final inspection it will be opened for use. O’Leary also explained the delay in the expansion project at the BP station at the corner of Harding Way and Portland Way. He said there was an issue between Fronteir and Englefield Oil about the amount of money it was going to take to splice or fiber optic lines that run alongside Portland Way South. O’Leary says he expects the project to proceed and that demolition of the current store on site should take place before too long. $240,000 for the purchase of two ambulances. One will be paid for with a FEMA grant. $124,000 for a boom mower. Expected delivery is two to six weeks. $731,000 for the TIF of the Brandt Road improvements made last year. The city will be reimbursed as property taxes are paid. $1,575 million to pay for phases four and five of the electric system upgrade. This upgrade includes the uptowne business district and northeast quadrant of the city. $1,139 million in existing notes. Councilman Tom Fellner explained this will pay off the principal and retire some of the debt. The notes previously paid for a new fire truck, three utility trucks, and a screw pump replacement at the Waste Water Treatment Plant. The Health Department rsome grant money and some transferred funds to help fund the department through the end of the year, although a little more funding may be needed in December. The funding totaled about $141,000. Tom O’Leary Russ Kent | Galion Inquirer The new restroom facility at South Park is completed. As soon as it passes its final inspection, it will be open to the public. https://www.galioninquirer.com/wp-content/uploads/sites/38/2017/07/web1_South-Park-crappers.jpgTom O’Leary Russ Kent | Galion Inquirer The new restroom facility at South Park is completed. As soon as it passes its final inspection, it will be open to the public.